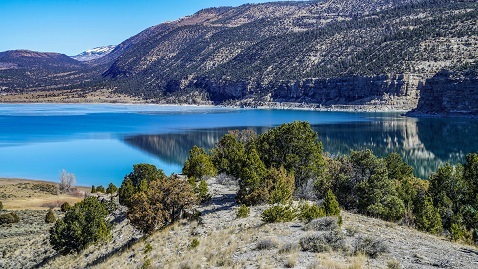 Joe's Valley Reservoir is located on the eastern slope of the Wasatch Plateau in the Manti-La Sal Mountains and is a principal component in the Emery County Reclamation Project constructed by the U.S. Bureau of Reclamation. It is located approximately 12 miles west of Orangeville, Utah. 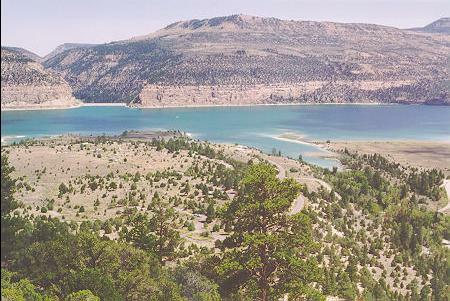 The shoreline is owned primarily by the Manti-La Sal National Forest with some private lands on the southwest shoreline. Above the lake at higher altitudes, above 8,000 feet, there are mountains, meadows and smaller lakes and streams. There are many unmarked, secluded camping sites available in the mountains on Forest Service ground a few miles above the reservoir. This area offers world-class hunting, fishing, bouldering and ice climbing. Click here to see the Joe's Valley Lake Cam.